Y’all can call me Shoelace. 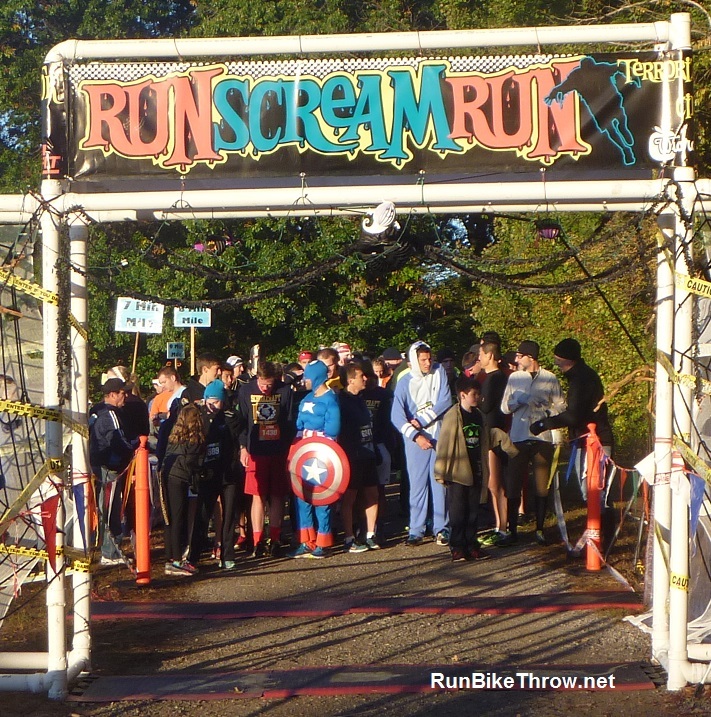 Last Saturday was Run Scream Run at Wiard’s Orchards in Ypsilanti. RSR is one of those fall races that attract a lot of casual runners and even non-runners, like turkey trots and chocolate runs do. Despite the chill (about 36 degrees before race start) the turnout was large and even the ghouls and witches were in good spirits. Here are some things about RSR that make it memorable, at least to those who participate. It’s at a cider mill. 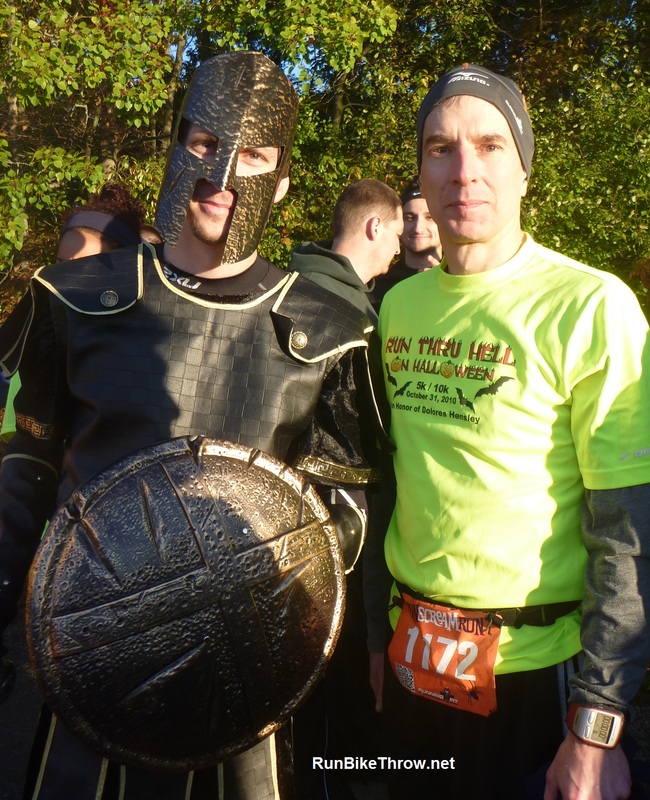 Hard to pick a better place for a fall fun race, and you can bring the family, too. Now, Wiard’s is not what you’d call your typical small-town, homey cider mill. No mistake, they are a big time operation. Which is fine – they have a lot of products to offer, and they easily accommodated the 1,700 runners and the other visitors. I have to say, though, that the cider in their refrigerators was pasteurized and had a preservative in it. I can get that kind of cider at Meijer, so I passed on it. The cinnamon donut was excellent, however. Costumes. 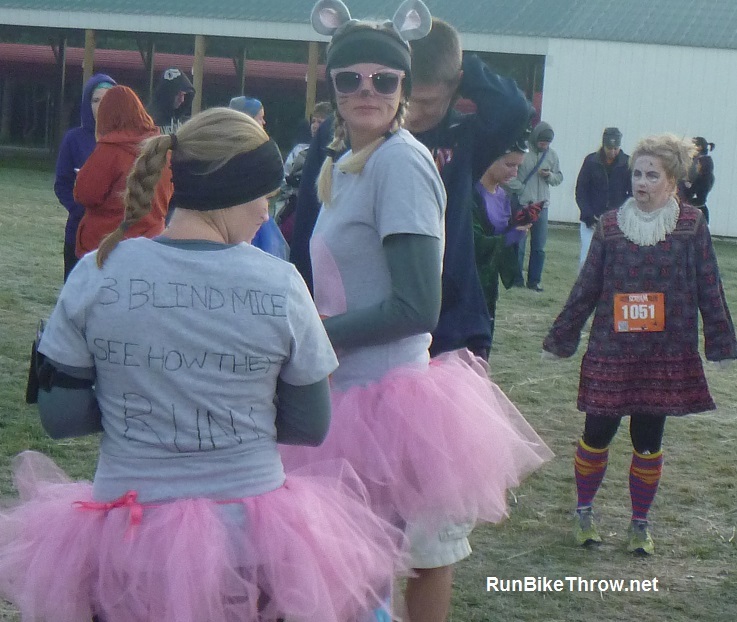 While many runners don’t bother to dress up, there are many who do, and some folks really go all out. 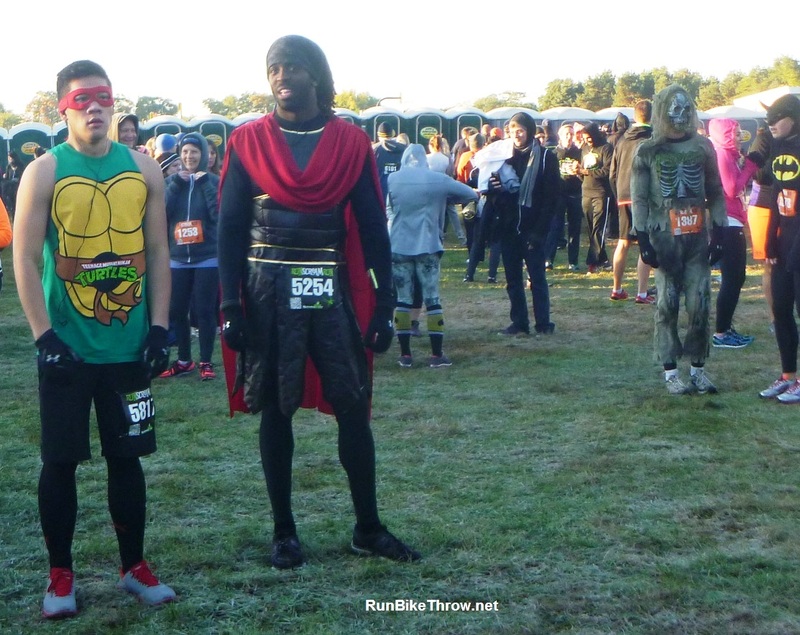 The guy in the shark pajamas (to the right of Captain America) won the 10K. Land sharks can run 5:30 miles. You have been warned! Hmmm…some things may actually be too scary for this blog. The course. Wiard’s has a whole set of haunted attractions, and some of it gets incorporated into the race. 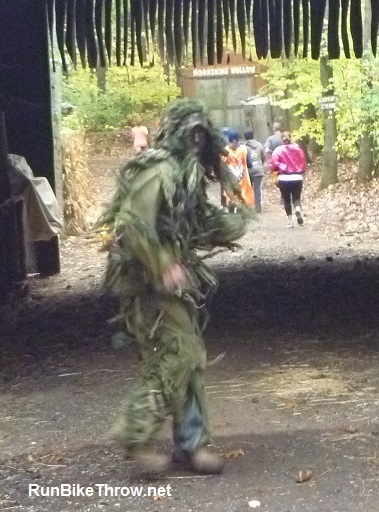 The first was a run through the “Fear Barn” – new this year, and a few people were nervous about it. As it turned out, it was very early in the race, and as I was actually running, I was in and out before anything really happened. Biggghh deal! More interesting is the Haunted Forest, which is a quarter mile or so of dirt path in the woods flanked by decrepit (by design) wooden buildings and inhabited by various nefarious creatures with chain saws and the like. They typically don’t bother the faster runners, but if you’re jogging or walking – watch out! And they post people in gruesome costumes at various points on the path – part paved, part grass, with many hiding places available. And just as I re-entered the main orchard, a zombie leaped up from the brush and yelled – and I jumped. He got me, all right! But with just a quarter mile to go, the shot of adrenaline was actually welcome. Oh, and the “shoelace” part? As I got into the starting queue, I noticed that my left shoe seemed loose, and I carefully retied it. So, naturally, it was my right shoe that came untied at the 2-mile mark. At a longer race, I would have stopped and fixed it, but this was a 10K and I was running well and didn’t want to get out of my groove. So I ran the remaining 4.2 miles with shoelaces flapping. Fortunately, the shoe stayed on, and I finished 14th with another age group win. 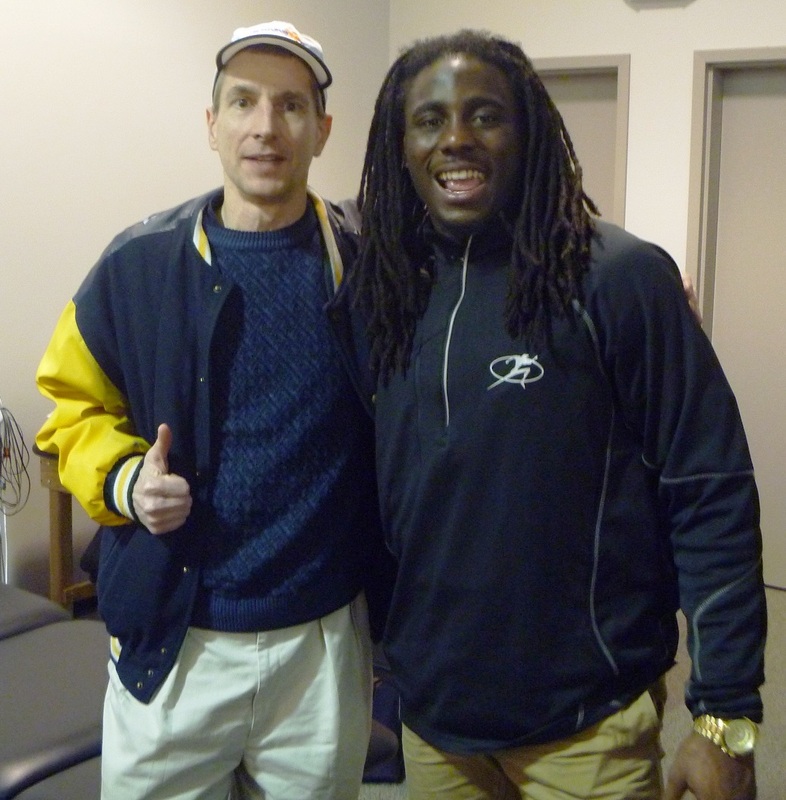 Me with UM’s famous “Shoelace”, Denard Robinson. Except that he’s better looking, has lots more hair and runs about seven times faster than I do, the resemblance is uncanny, don’t you think?. 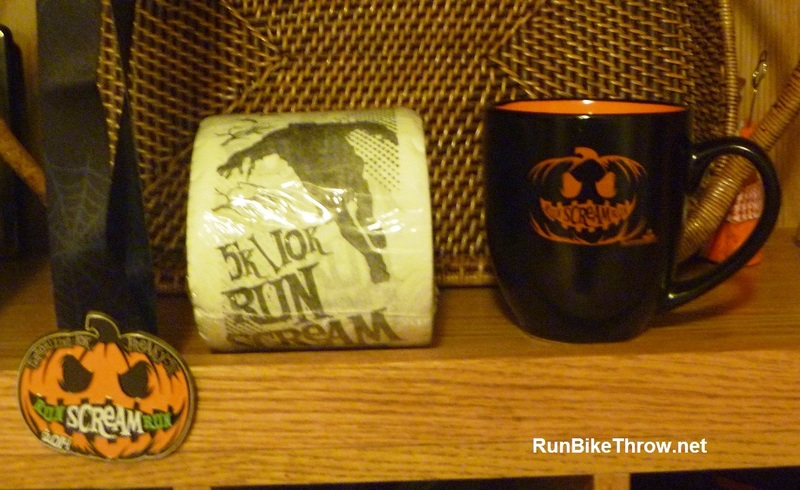 Kind of hard to believe, but I have no more “official” races until the Holiday Hustle on December 13. Just pacing the Kona races and fun stuff until then. The five races in six weeks sure went fast. I’ll let you know if I go stir crazy and sign up for something else! Also memorable. Seen here: 2014 medal, 2012 age group award (yep, it’s what you think it is), 2014 award. This entry was posted in Running & Cycling and tagged 10K, fitness, medical, Run Scream Run, Running, Running Fit, untied shoes, Wiard's. Bookmark the permalink.